This post happened because of my last one, when a reader on Facebook asked aboutGarden Party bags that came with slings, which stumped me for a while. Yes, I’ve seen them online on Instagram, but I wasn’t sure myself if they were vintage or worse, you know, copies with added improvements. Well that mystery is officially solved, and I can now safely tell you that what we’ve been seeing is actually this: Hermès’ Garden Party36 Pockets. Called Garden Party36 because it measures almost 36 cm from end to end, it also comes with a sling that’s adjustable as well. There are also pockets that go around the exterior of the bag, and if I’m not wrong, 3 on the front and 3 on the back, which makes it a great workhorse as well, one that that offers additional space for your bits and bobs. Available in a variety of colours on regular canvas and even one that comes striped (they call it Riga canvas), I’ve only seen them offered online so far over on Hermès UK and US sites. Priced at GBP2440 and USD3974 respectively, they should be aroundSGD5000 or so in Singapore, though honestly I haven’t seen any as yet. Not cheap by any standards yes, but affordable by Hermès’ standards. And one that should fly off the shelves pretty quickly too, given how popular the Garden Party totes already are anyway. Adding a shoulder sling just makes them even more desirable (and user-friendly) if you ask me. 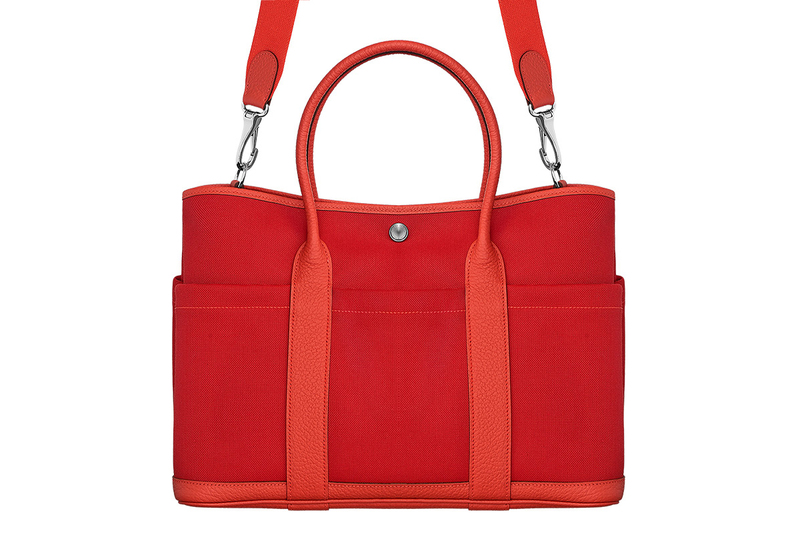 Want to see a new bag made by Hermes? It’s about time right? Well, it’s not really new but its something you haven’t spotted yet. First of all, the original Hermes Garden Party Bag doesn’t need any introduction because it has been around for sometime. And we know the Hermes Garden Party is ideal for almost any occasion – for work, the weekends or shopping. It’s feminine and has large spacious to carry so much more than your basic essentials. But anyways, allow us to introduce something different; Meet Hermes Garden Party Pockets Bag. The one we are sharing is made from calf leather in combination with cotton. It’s refined with palladium hardware and the interior features a zip-closure. The shoulder strap can be adjusted anytime you want – it can be carried on your hand or even on your shoulder. Sow what’s new about this bag? Well, the name already revealed the secrets – it got extra pockets on the front and it has a squared shape (if you compare it to the original Hermes Garden Party Bag). But other elements like the button on the front, the handles and most of the design are basically the same. By now you should already know that Chanel do not publish all their latest handbags on their website. They leave the crumbs for us to pick at their Chanel boutiques and sometimes crumbs can be very tasty. For example, like the Chanel Caviar Easy Flap Bag. This handbag has never been revealed on their website, we needed to visit their store to find out. All right and here’s another one that might interest you. How we get to know this handbag is kind-of a funny story. One of our readers, Ornoi, published a video in our comment section, she showed in details on how this bag looks, and it’s truly amazing. She bought this bag in October 2014 in Frankfurt, Germany. It’s a medium sized flap bag, probably cheaper than the iconic Classic Flap Bags. The color is Bordeaux and it’s made from lambskin. The leather is luxurious – with beautiful stitches and it feels butterly soft. The CC closure is the same like the Classic Flap Bag, but the difference is that the Chanel Around Pockets Flap Bag comes with extra side pockets. The rest is still the same, like the interwoven chain links. The interior is quite large, it comes with a zip pocket too. Simply a gorgeous handbag and an alternative for anyone that loves Chanel. We do not have the style code, the exact prices and the colors available.